Home › Theatre › Louis le Brocquy, one of Ireland’s most renowned artists dies. Louis le Brocquy, one of Ireland’s most renowned artists dies. ­ Today Ireland lost its most renowned living artist, Louis le Brocquy, at the age of 95. A self-taught artist, his pioneering approach to modernism art was influenced by the European masters. Le Brocquay is one of a hand full of Irish modern painters who works have gained international acclaim. His work included portraits of W.B. Yeats, James Joyce and his friends Samuel Beckett, Francis Bacon, Seamus Heaney and Bono. In recent years le Brocquy’s early “Tinker” subjects and Grey period “Family” paintings, have attracted attention on the international marketplace placing le Brocquy among a select group of British and Irish artists whose works have commanded prices in excess of €1 million during their lifetimes that include Lucian Freud, David Hockney and Francis Bacon. Le Brocquy was also the first living artist to be represented in the permanent collection of the National Gallery of Ireland. His works in collection include Self-Portrait (1947), A Family (1951), the large tapestry Triumph of Cúchulainn (2001), which hangs in the Millennium Wing, and Image of Bono (2003), which was commissioned for the National Portrait Collection. A testament of his international standing in the arts world can be measured with works by Le Brocquy’s held in the collections of numerous museums throughout the world including the Guggenheim in New York, the Columbus Museum in Ohio and the Picasso Museum in Antibes. Louis le Brocquy has received numerous awards and honorary Degrees throughout his life both at home and abroad. In France he has been made Chevalier de la Légion d’Honneur in 1975, and Officier des Arts et des Lettres in 1996. In Belgium he was made Officier de l’Ordre de la Couronne Belge in 2001. He was Elected Saoi of Aosdána conferred by President Mary Robinson in 1992. In 1998 he was the first artist to receive the IMMA/Glen Dimplex lifetime Achievement Award for a “sustained contribution to the arts in Ireland”. In 2007 Dublin City acknowledged one of its most talented creative citizens when Louis le Brocquy received the freedom of the city. 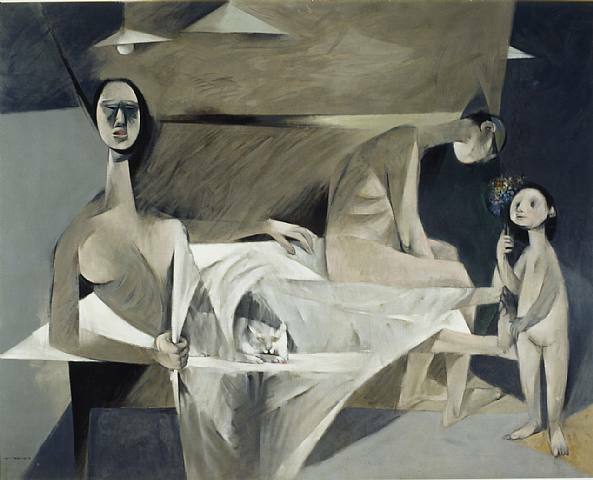 In a recent TV programme Ireland’s Greatest painting Le Brocquy’s ‘A Family’ 1951, was one of the 10 final selections, and will be getting my vote. Cast your vote here. 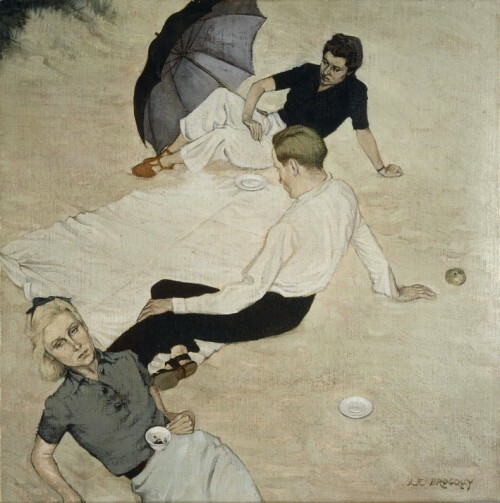 Louis le Brocquy died following a long illness with his wife, artist Anne Madden, at his side. He is also survived by his sons Pierre and Alexis. Information complied by Tom Dowling, primary source Ann Madden website. ‹ This Must Be The Place – wacky but not in a good way.